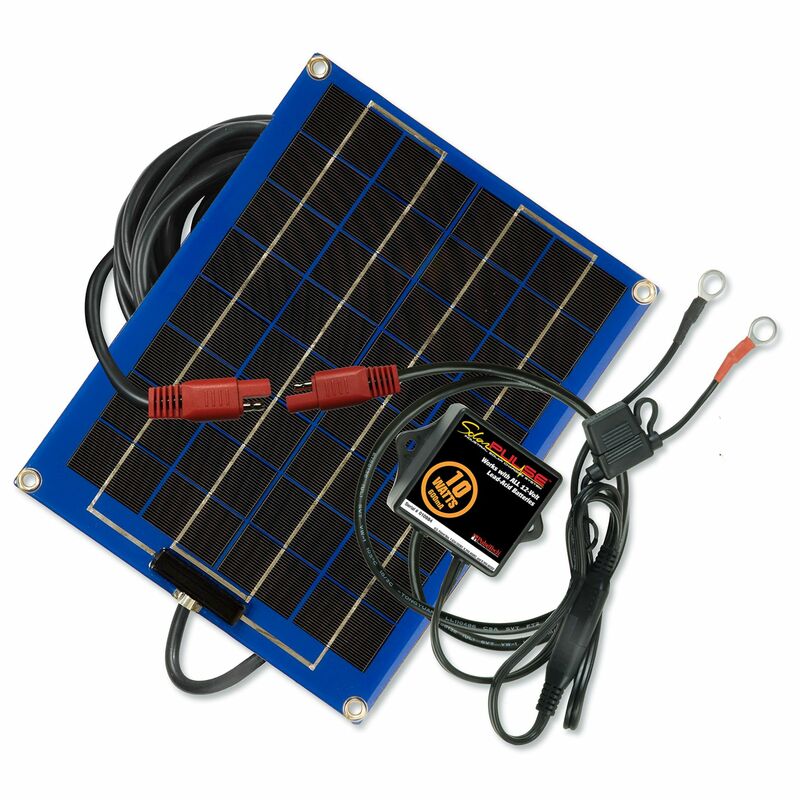 The PulseTech SP-10 provides a full 10 watts of power in a compact, durable 12.41"L x 9.85" W x 0.2" H solar panel. Its low mounting profile allows for multiple installation options on vehicles or equipment stored outside. This solar panel replaces the power loss from electrical accessories that occurs even when the ignition is switched off and PulseTech’s patented Pulse Technology reverses the damaging effects of naturally occurring sulfates extending battery life up to three times. Rated at 625 mA, the SP-10 charges, maintains and desulfates any type of 12- volt lead-acid battery system including AGM (maintenance-free), flooded cell, gel cell and VRLA. It utilizes PulseTech’s unrivaled solar charging system combined with a patented optimized high-frequency pulsing circuit to ensure batteries always start and release maximum power when needed no matter how long they’ve been sitting unused. Our uniquely designed SolarPulse solar panels are made of highly efficient monocrystalline silicon photovoltaic cells, encapsulated with a clear polyurethane plastic coating (instead of a breakable glass coating), and mounted on a laminated aluminum substrate back plate that is less than 1 ⁄4" thick. This makes the panel virtually indestructible, impervious to weather and resistant to damage. PulseTech’s higher efficiency, higher quality monocrystalline silicone cells pack more power per square inch and have a longer life than standard amorphous “thin film” cells. That means you can get the power you need in a sturdier, smaller-sized solar panel. An LED light indicates charge so you know when it’s working. The LED shines brightly when the solar panel is in full sunlight and working at optimum level, blinks when the panel is exposed to partial sunlight and goes out at night. Reverse polarity protected. It comes with a 3' box-to-lug wire and 17" box-to-panel wire. Excellent for maintaining larger 12 volt batteries, average of 2.5 to 3.75 amps of trickle charge per sunny day. Do you own the SP-10? Please, tell us what you think about it. It helps us provide you with better products. Please note that it may take up to 72 hours for your review to appear.